The Port of London Authority’s magnificent former headquarters at Tower Hill. This watercolour was painted by Sir Edwin Cooper, the building’s architect. The Port of London Authority has been the guardian of the tidal River Thames for over a century, although in recent decades its role has changed substantially from that for which it was originally conceived. In the late 18th century the main issue at the Port of London had been the lack of facilities for berthing and unloading ships, leading to lengthy delays and congestion. The government set up a commission to consider the problem at that time, leading to the creation of docks owned by individual companies. A hundred years later there were too many docks of the wrong kind, a lack of coordination between the multitude of docks, and no effective authority to manage the river. In 1900 the government once again set up a royal commission to consider the problems. During their investigation the eminent commissioners made visits to London’s docks and wharves, as well as other major British ports, and made enquiries of Continental ports such as Hamburg and Rotterdam. Some of the findings during the review process were that the facilities in the port were outdated because of lack of investment; the river was too shallow to allow ships to reach the upper docks and wharves due to neglect by the Thames Conservancy; there were divisions of responsibility that obstructed improvement of the Port; the turnaround times for loading and unloading ships were too slow; railway connections were poor; and docking charges were too high. The docks were not up to modern standards but the commission believed they were capable of further development. The recommendation, published in June 1902, was that a single public authority should be created to manage both the docks and the tidal river, from Teddington down to the sea. The government considered the problem and began the process of nationalizing London’s docks. 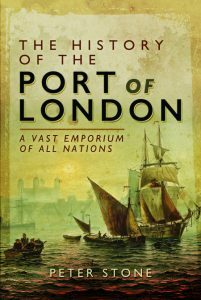 The creation of the Port of London Authority was introduced in the King’s Speech at the Opening of Parliament in November 1903. It was then delayed for several years as discussions took place about how the Port should be organized. There were those who believed the plans were a dangerous move towards socialism. Some advocated creating new, more efficient and cheaper wharves instead of upgrading the enclosed docks. The first attempt at a Bill was abandoned by the Conservative government. In the meantime, alternative Bills were promoted by the London & India Docks, the Thames Conservancy and London County Council, and another was for the amalgamation of the London & India and Millwall companies. In the summer of 1906 David Lloyd George, President of the Board of Trade in the new Liberal government, visited some of the Continental ports to investigate how they were managed. He came to the conclusion that a single nationalized authority was indeed the best solution. He proceeded to strike a deal with the dock companies and the Port of London Act was passed in December 1908 despite some opposition. The final acquisition of the London docks and their storage facilities was concluded under Lloyd George’s successor at the Board of Trade, Winston Churchill. The management of the tidal River Thames and its docks were assigned to the Port of London Authority, which began operating in March 1909, and was accountable to the Board of Trade. It was headed by a Board consisting of between 15 and 28 members representing all the various interested parties, including the government, shipowners, wharfingers, lightermen, London’s public authorities, Trinity House, the National Ports, the Admiralty and the workers. Up to four of the members could be nominated by the London County Council, two each by the City of London and Board of Trade and one each by the Admiralty and Trinity House. One each of the LCC and Board of Trade members were to represent the labour force. Following the example of the Mersey Docks & Harbour Board, the PLA was created as a non-profit, self-governing trust in which any excess revenues would be used to improve the river and port facilities or to reduce charges. The Authority took on obligations for maintenance of the river channels, provision of moorings, regulation of river traffic, the licensing of wharves, the removal of wrecks, and the prevention of pollution. It took over the duties of the Thames Conservancy on the Lower Thames, the latter thereafter having responsibility only for the upper, non-tidal river. Registration of licensing of craft, watermen and lightermen was taken from the Watermen’s Company. Responsible for sixty-nine miles of tidal river downstream from Teddington to the Thames Estuary, the PLA had the authority and scope to solve many of the long-term problems, including dredging the river and regulating dock labour. In 1910 the PLA created its own police force and ambulance service. A Criminal Investigation Department was formed in 1913. Trinity House retained jurisdiction over pilotage on the river as well as for buoys and lighting. The City of London continued to deal with health issues regarding ships, passengers and cargoes. The PLA inherited almost 3,000 acres of estate, including that of the London & India, Millwall, and Surrey Commercial companies, with 32 miles of quays, as well as 17 London County Council passenger piers. The numerous riverside wharves remained in private hands. Towage within the docks was the responsibility of the Authority although on the open river it remained in the hands of private tug companies. At the time of its creation it employed over 11,000 people, almost all of them men. Most were ordinary dockers for cargo-handling but there were also those with specialist skills and training such as dockmasters, stevedores, timber porters, barge-handlers, coopers, divers and inspectors. Others undertook clerical work in the offices or packed and bottled. Over 1,000 worked in the headquarters and dock offices, more than 7,000 as permanently employed dock-workers, plus an average of around 3,000 casual labourers hired each day. The number of workers had increased by 1911 to over 13,000, remaining fairly constant until after the Second World War. The first chairman of the PLA was the energetic and forceful Sir Hudson Kearley MP. As Parliamentary Secretary to the Board of Trade he had been responsible for steering the Port of London Act through the House of Commons. Starting work at sixteen for the Tetley tea company, he made his fortune as the founder of the tea importer Kearley & Tonge and the International Stores grocery retailer, which had 200 branches. He was elevated to become Lord Devonport in 1910.